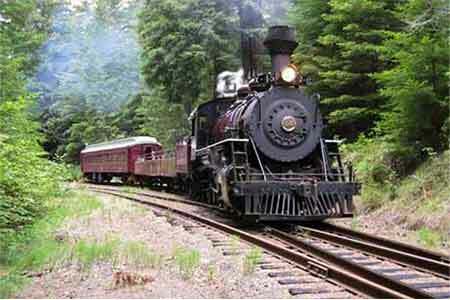 One of the most recommended Things To Do in Willits, CA is the picturesque Skunk Train. The Train that brings the beauty of some of the most majestic Redwood Trees in the clear. Come see what makes The Skunk Train such a wonderful stop on your journey. Is the Skunk Train Dog Friendly? Where does the Skunk Train Go? Come ride the Skunk in its natural habitat. Forty miles of railroad run through majestic redwood forests, scenic mountain meadows, and over 30 trestles bridging the pristine mountain waters of Northern California. 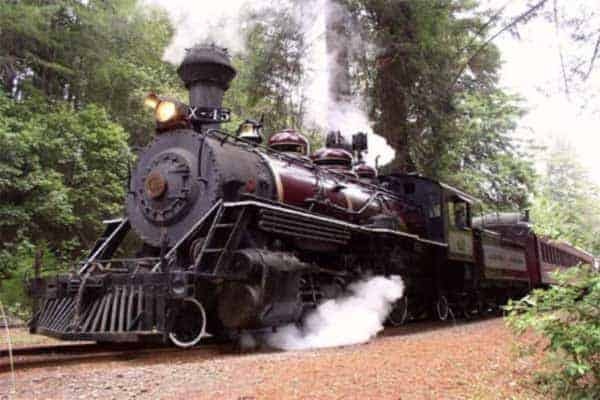 Departing from Willits and traveling to Northspur, your train will climb the Eastern slope of the Coastal Mountain Range and cut through it at Tunnel #2 (the Summit) before descending down into the redwood-thick Noyo River Canyon. This 4-hour, 40-mile roundtrip allows you to explore the wonderful forest where the world’s tallest trees take you back in time. Once you arrive at Northspur, the midpoint of the railroad, you will disembark for an opportunity to walk around, purchase lunch, and breathe the pristine mountain air. Departing from Fort Bragg your train will travel along the Pudding Creek Estuary to Glen Blair Junction on this short and scenic 1-hour, 7-mile roundtrip. You will be traveling over some of the first tracks laid down by the California Western Railroad in 1885. Once the train stops it will immediately return to Fort Bragg. This 4 to 4.5-hour round trip departs Willits and begins the steep ascent (3.5% grade) to the summit of our line at 1,740 feet. Traveling through Tunnel No. 2, the trip descends into the Noyo River Canyon. In one spot, you will travel 8.5 miles to cover a straight-line distance of less than one mile in a serpentine of switchbacks. From Willits we operate the vintage 1925 M-100 motorcar / railcruiser or a diesel locomotive pulling passneger coaches and an open air car. 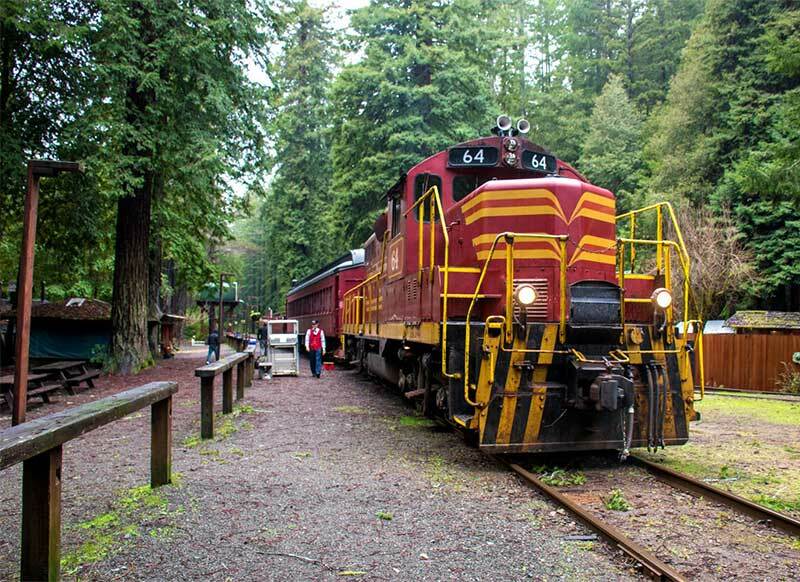 Journey by rail to a historic logging camp in the rugged and scenic Noyo River Canyon. Accessible only by train, Camp Noyo is a world unto itself – with eight private campsites and a river view chalet, this is a well-equipped camping wonderland. The river offers opportunities for canoeing, kayaking, swimming, and more. This holiday season, share your cookies with Santa Claus and his elves aboard our Magical Christmas Train. We deliver Santa right to your table, so you can skip the lines and experience Christmas through the imagination of a child. Celebrate fall by climbing aboard our Pumpkin Express! Join us on this beautiful round trip to an autumnal wonderland at Northspur Station. Once there, kids will be able to choose their own pumpkin and enjoy delicious treats. I'd long wanted to ride the famous Skunk Train, so when my husband and I planned our 30th anniversary trip in the area...Eager guests, many of them families with young children, filed into the two cars, bound for the beautiful forested area outside of Willets, but we weren't the only ones aboard. We were joined by Santa and Mrs. Claus, several of Santa's elves, and a strolling musician who regaled us with kid-friendly songs. Throughout the journey, we enjoyed a variety of fun activities: sipping hot chocolate from our souvenir mugs, munching on big sugar cookies, singing carols, hearing an ongoing story about a missing teddy bear that engaged the youngsters, and participating in a pompom-ball snowball fight...the Skunk Train would be a joyful outing for all ages. I highly recommend taking a trip. We rode the big train out of Willits, CA. the outside standing train was a hit. It was so nice to travel through the woods in an open air car. Guitar man was playing old Railroad songs and was great entertainment. Small food cart available, At the turn around food was out the roof on prices but good. Traveling through the Redwoods is just very majestic, If we go through there again it will be first on our list of things to do. We did not take the small yellow train, I am not sure I would like that. Unfortunately, there aren’t any Coupon Codes available for the Skunk Train. They do offer discounts for group travels. The Old West Inn does offer a service to book tickets directly with us. The Old West Inn became a part of the Skunk Depot family in 2016 as one of the lodgings who could book tickets for the Skunk Train. We work extensively with tour operators. We are members of the American Bus Association (ABA) and National Tour Association (NTA). Please click here for our profile sheet. For groups of 20 or more, we offer a 10% group discount; larger discounts are available for multiple contracted trips. Dogs are the only pets permitted on board. We do ask that you be considerate of your canine though – they simply may not like trains. Please bring whatever they need to be comfortable (food, water, dishes, a leash, etc.). Starting in 2013, there will be a charge for canine passengers. 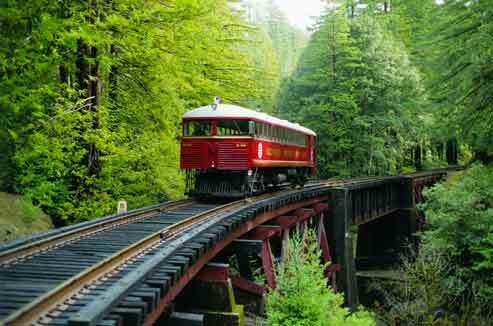 Embark on the Skunk Train and spend the night in the rugged Noyo River Canyon, 17 miles east of Fort Bragg. Originally a logging camp along the famed route of the Skunk Train, Camp Noyo is a remote wilderness area that will be your new favorite campsite—and only accessible via train. Camp Noyo was first developed as a logging camp for the Union Lumber Company in 1907. Originally called “Camp Four,” it was the fourth camp established by the lumber company as they progressed east from Fort Bragg along the current route of the California Western Railroad. In 1933, the Union Lumber Company donated the property to the Boy Scouts of America. The Boy Scouts began using the site in the summer 1934 and continue to use the property for several weeks every summer. In 2012, Allan Hemphill, his son Brian, and a small group of family friends purchased the property from the Boy Scouts. The Hemphill family has been caretaking Camp Noyo for over 60 years. Now under new ownership, Camp Noyo has been made available to the general public on a very limited basis. This unique property has eight private campsites and one River View Chalet, flush toilet, wood-heated showers, and the use of canoes, kayaks, and row boats. All campsites have benches for your group. The seasonal summer dam creates an estuary that allows boat access to a mile of the river upstream of the camp; the dam is in place from mid-June to mid-September, with ample swimming and boating water year-round. The Noyo River is crystal clear and cold and has several very deep pools that are home to rainbow trout, steelhead, salmon, river otters, ducks, salamanders, and frogs. Enjoy a brisk swim or just nap under the afternoon sun and on the floating dock anchored in the middle of the river. Interested parties are encouraged to book their reservation early for this truly unique opportunity. Why the name “Skunk Train”? The railroad’s historic name is California Western Railroad. While you can travel certain times of the year without having booked in advance, we always encourage a reservation. Yes, we take Visa, MasterCard, and Discover. For purchases made on the train or at Northspur, we accept cash only. Yes – but there are limitations, given that our railcars were built in the very early 1900s. We strive to make every guest feel comfortable and will do our very best to accommodate your visit. All of our trains have a concession on board where you can purchase snacks and beverages. In the event someone in your party has dietary restrictions then by all means bring whatever is necessary. Of course, parents traveling with babies and children requiring special food and beverage items are also allowed. If you are riding a BBQ Dinner train, dinner is served to you upon arrival at Northspur. Absolutely not. We have a wonderful selection of wine from beautiful Mendocino County – which by the way is America’s Greenest Wine Growing Region – and local beers, including our very own Skunk Beer (bottled for us by Anderson Valley Brewing Company), plus a full bar on board the train. Do your trains leave on time? Without question we try to maintain our schedule. If you miss a train we will issue you a gift certificate for a future ride or book you on the next available departure. We will not, however, issue a refund because you’ve missed the scheduled departure. Comfortable and casual layered clothing is suggested to keep warm in the chilly months. If you plan on riding the Open Air Observation Car then we suggest dark clothing, because sometimes lighter clothing can get soot spots on it. Willits is the eastern most depot on the Skunk Train's rail line. Fort Bragg is located on the rugged Northern California Pacific coast.